The boutiques of New York City are like a bed of oysters. Some are appetizing, some unbearable, and occasionally, you find one with a perfect pearl. With the aesthetic of providing emerging designers a space to sell overstock, rather than tossing their hard work to the curb, Inven.tory is undeniably of the pearlescent variety. The stark white exterior cloaks an unrefined, modern art gallery-esque boutique in the original corner-shop on Kenmare Street. 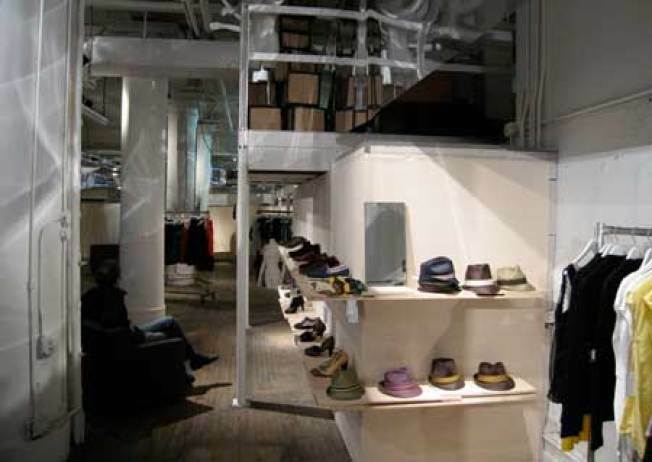 Complete with exposed brick, unfinished wooden tables, and clothing suspended from the ceiling like raw meat, the outlet suggests another overpriced store with unnecessarily bitchy salespeople. It’s anything but. “One morning I was sneaking a little whiskey shot,” recalls Mike Townsend, one of the boutiques founders, “and I didn’t realize that a customer was in the store. The man walked over, mute, and took the lid off his coffee cup, and I splashed his coffee with a little whiskey. As he walked out he replied ‘This is my new favorite store.’” And it’s ours too. With gasp-inducing price tags and a stirring selection of labels, such as Idol Radec, Orthodox, and Rhys Dwfen, five minutes inside and you won’t be able to keep your pants on. Amidst the whirlwind of opening a second store on Lafayette Street, as well as hosting Cheap Monday’s Customized Jeans Tour inside the new joint, Mike took some time to discuss the story behind Inven.tory. Where does the name Inven.tory come from? Why the separation in the middle? The name Inven.tory was created with my good friend Cory Gomberg. Cory and I were together and we were throwing names and ideas out. We liked stores that had a simple name that was literal and straight to the point, and out came Inven.tory. The separation came about to break up the look a little. We wanted it to be distinctive and unique. What inspired you to open a wholesale boutique? The inspiration behind the wholesale boutique was to help young designers find an outlet for their overstock without losing their brand image and credibility. Also the concept of a curated, well merchandised boutique that offers wholesale prices has never been done. How did you choose the location for the first store? Second store? The first store, 19 Kenmare, was found by my partner, Jon Daou. He had his eye on the space and knew that the corner had great energy. Jon and Whitney both took me to the space, and I freaked out and was instantly in love with the space. I knew we had to have our first store there. Jon also found the second store. We saw it and realized that the size was great for what we wanted. We knew that the space would work really well with the raw aesthetic that we wanted to convey—I am really inspired by the retail space in Berlin and Shanghai. Who are your partners-in-crime at Inven.tory? My partners in crime at Inven.tory are Jon Daou and Whitney Singer. We met one night at an event for Brantley Gutierrez at Open House gallery—Whitney and Jon are the owners of the space. We quickly became friends, and Whitney and Jon wanted to get into retail. We started doing sample sales at the Open House gallery space, and then our idea of a store came to mind. And here we are now! Kat Berkery has also been very instrumental in the whole deal as well. All four of us work as a team and are able to synthesize our best qualities together. We (Kat Berkery being the buyer) like to pick categories and trends that have to fit our price points. We are very price-point conscious when picking what goes in the store. At the new store, we have some brands that Inven.tory will be collaborating with at our price points. We want to be able to work with designers and not rip them off. What’s your favorite label Inven.tory carries? Favorite piece of clothing currently in the store? I won’t tell you who my favorite is, but I really like this pair of cropped chinos we have in and am always a sucker for the Romance T-shirts. As for womenswear, I think I would say the selection of handbags and jumpsuits-onsies are my favorite. Who is your favorite designer? Style icon or source of inspiration for your personal style? I really like Robert Gellar at the moment and what he is doing with his line. I am also a huge fan for my friends at Idol Radec; I purely enjoy everything that they create. If you could go back to any time period, which would it be? I would say I love the 1920s—Great Gatsby when Hemingway and Fitzgerald were in Paris. It was a time before modern communication and the focus of people’s social life revolved around conversations and socializing was centered around the art scene. Favorite artist? Musician? Book and/or writer? Artist: Max Ernst. Musician: Helio Sequence. Author: Kurt Vonnegut. I find that traveling and meeting new people and seeing different cultures is one of the most exciting things to do with your life and time. What’s your favorite thing about New York City? My favorite thing about New York City is the drive the people have here. All my friends really hustle and strive to do and work on/for something they are really proud of. People like Colin Tunstall, Morgan Collett, Jared Flint, Kat Berkery, Josh Rosen, Whitney Singer, Errol Silverstein, Jeremy Schaller, Audrey soon-to-be Robinson, Cory Gomberg, David Zahabian, Matthew Grzywinski, Jon Daou, Dylan Hales, Sean Ennis, David Schulze, M, and Creed. Last words you want to leave us with? “If it fails, admit it frankly and try another. But above all, try something” FDR. I think this still rings true for Americans today.